Salsa Verdi or green sauce is very welcome in my fridge. 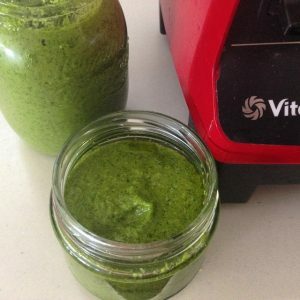 In your blender pop stacks of herbs like mint, parsley, basil, oregano, tarragon and a little rosemary. Add in some gherkins, garlic, Dijon mustard, red onion, lemon zest(or the whole thing if you have a high speed blender), spring onions, apple cider vinegar, olive oil and sea salt. Anchovies if that’s your thing. Use it on pasta, veggies, wraps, grains, roast, as a marinade on your poultry, on your eggs – it’s endless and ever so good for your liver and packed with iron, calcium and natural folate.